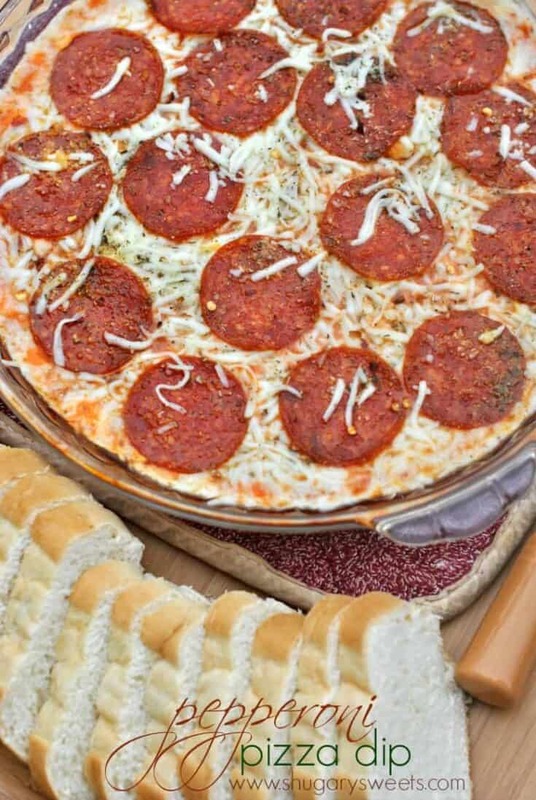 Easy Pepperoni Pizza Dip recipe! Made in the microwave in just minutes, this easy game day staple is sure to please! So, can I be totally honest with you guys? Sometimes, I’m guilty of making dip for dinner. Like, this queso dip…yep it was dinner one night. Today’s pizza dip recipe was no exception! But think about it. 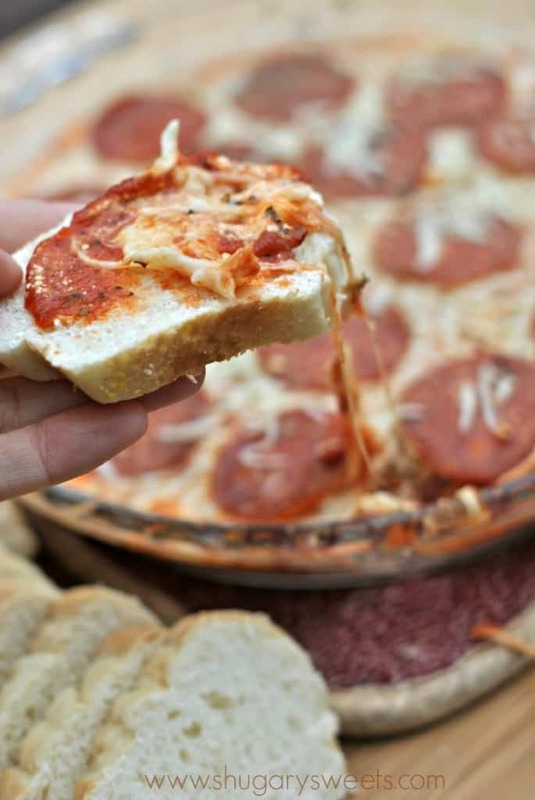 Cheese, pepperoni, bread, pizza sauce. It seriously covers all the basic food groups, right? Anyway, I remember the first time I saw this dip. It was the year I graduated nursing school (1996) and I was in orientation on a medical-surgical hospital floor. As was customary back then, weekends in the nurses lounge were like a big potluck. Sometimes it was an organized food fest, with a theme. But most of the time the nurses randomly brought food to share with each other. There was always a big tin of candy and cookies from patients and doctors as well. But back to this dip. I remember this dip so clearly because while I was in orientation, I was also pregnant with my first child and suffering with morning sickness. I had to avoid everything with red sauce, just the thought of red sauce made me nauseous. So when I saw this dip in the back room, I was saddened that I couldn’t try it. 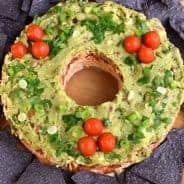 My friend gave me the recipe though, and as soon as my son was delivered, this dip was all I could think about. And it became a staple at many birthday parties, BBQ’s and get togethers with my family for years! But there was a difference. It wasn’t made with pepperoni. 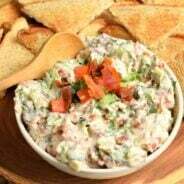 I first tried (and made) this dip using chopped green peppers and onion on top. Which, my friends, is a delicious way to eat this dip (with or without the pepperoni)! Here in Ohio, for whatever reason, Pepperoni Pizza rolls are a big thing (maybe they are a big thing everywhere and I never noticed??). So I turned everyone’s favorite pizza roll into a dip. I thought I was so clever and smart. And then I went on Pinterest and realized…I’m not so creative, this has been done a million times before. Hahaha!!! But, it hasn’t been done with MY story. So think of me next time you eat this dip. Unless that’s weird for you. Cause it’s kinda weird for me! In a microwave safe 9-inch pie plate, spread room temperature (softened) cream cheese evenly to cover the bottom of dish. Sprinkle with 1 tsp Italian seasoning and 1/2 tsp oregano. Top with pizza sauce. Sprinkle the cheeses over the sauce and top with the pepperoni. Add the remaining Italian seasoning, oregano and crushed red pepper by sprinkling it over the top. Cover pie plate with plastic wrap and microwave for 4-6 minutes, time will vary depending on microwave. Dip is done when cheese is melted and bubbly. Serve with crusty french bread or crackers. ENJOY. Change up your toppings by swapping out the pepperoni and adding diced green pepper and onion instead! Looking for more great GAME DAY ideas? My GAME DAY PINTEREST board is full of recipes to make your next party a hit! 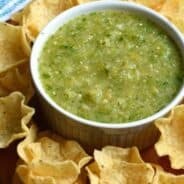 Artichoke Jalapeno Dip makes a great snack. Perfect for game day or any day! 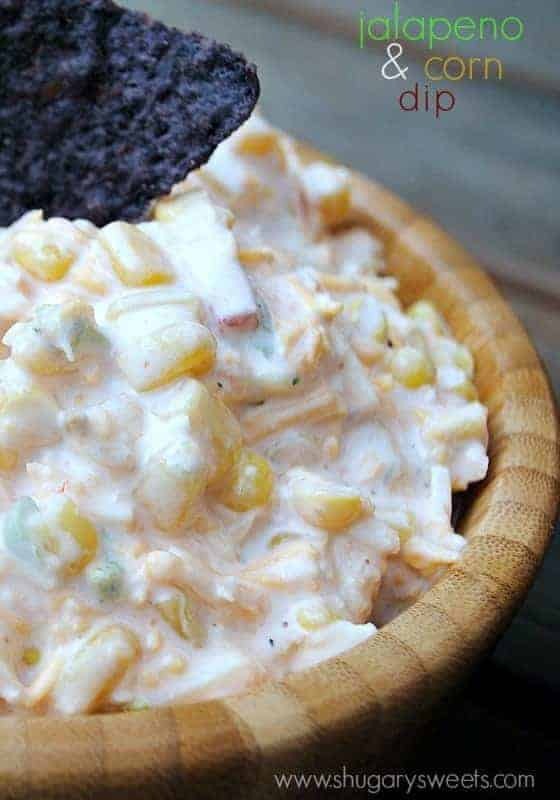 Jalapeno Corn Dip: this is one of my most requested recipes at family potlucks! 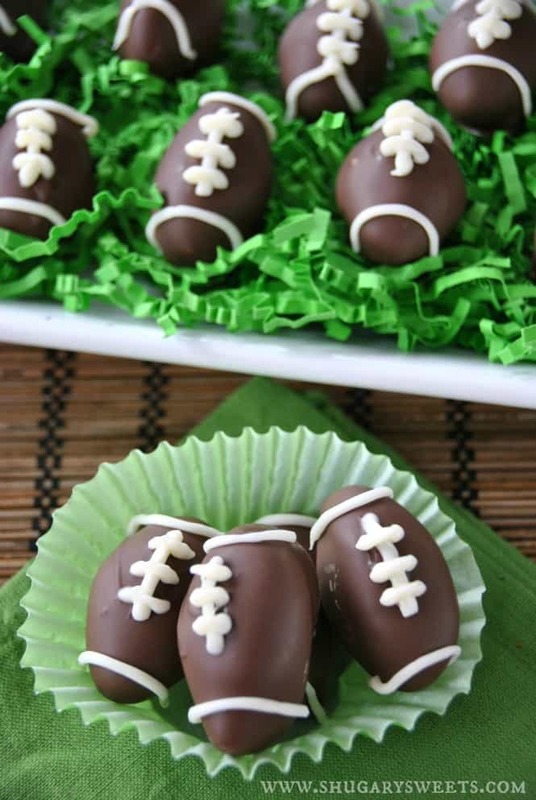 These EASY Peppermint Patty Footballs are not only delicious, but adorable too! 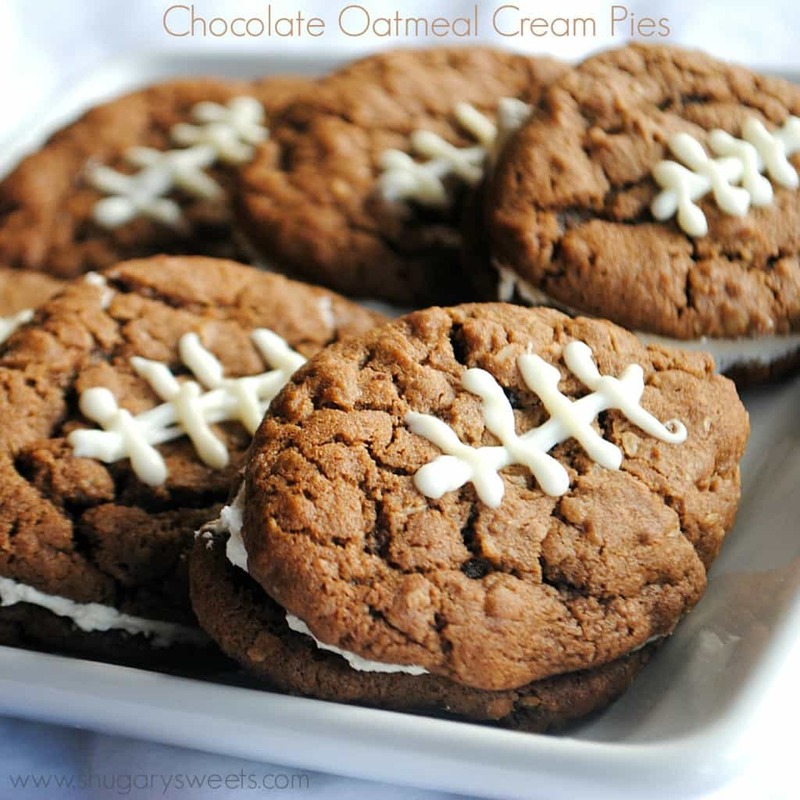 My kids LOVE these Chocolate Oatmeal Cream pies…especially when they are in football shapes! 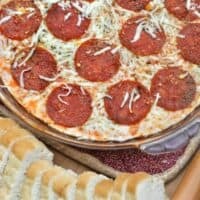 Easy Pepperoni Pizza Dip recipe! Who wants a little cheese at their next tailgating party? In a microwave safe 9-inch pie plate, spread softened cream cheese evenly to cover the bottom of dish. Sprinkle with 1 tsp Italian seasoning and 1/2 tsp oregano. Top with pizza sauce. Sprinkle the cheeses over the sauce and top with the pepperoni. Add the remaining Italian seasoning, oregano and crushed red pepper by sprinkling it over the top. You can substitute chopped green pepper and chopped onion for the pepperoni if desired (about 1 cup total). 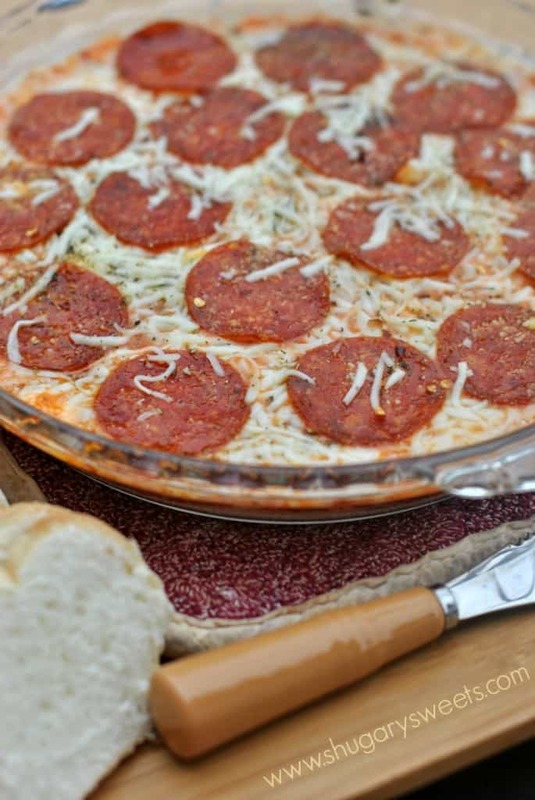 Today’s recipe for Pepperoni pizza dip was originally published on Shugary Sweets on November 9, 2013 and has been republished in August 2018. Oh my yum! No reason to feel guilty about this for dinner! Totally allowed. This looks incredible! I love this dip. I could eat it as my meal! When I feel like I’ve most certainly developed the next best recipe, I can always go to Pinterest and have my bubble burst finding a thousand pins of the almost identical recipe. Curse you Pinterest! 🙂 But it’s always the stories that make them different. Loved the story and the recipe…good job! My kids would freak out about this. Well, not my daughter…she’d throw all her pepperoni at her brother. But my son? He’d inhale it. So would I. If I didn’t live with 1/2 a dozen meat and potatoes people, I would live off of dips! Haha, I felt that way when I made pizza sandwiches and felt so smart … until I searched on Pinterest:) Ah well, my family thought it was great! 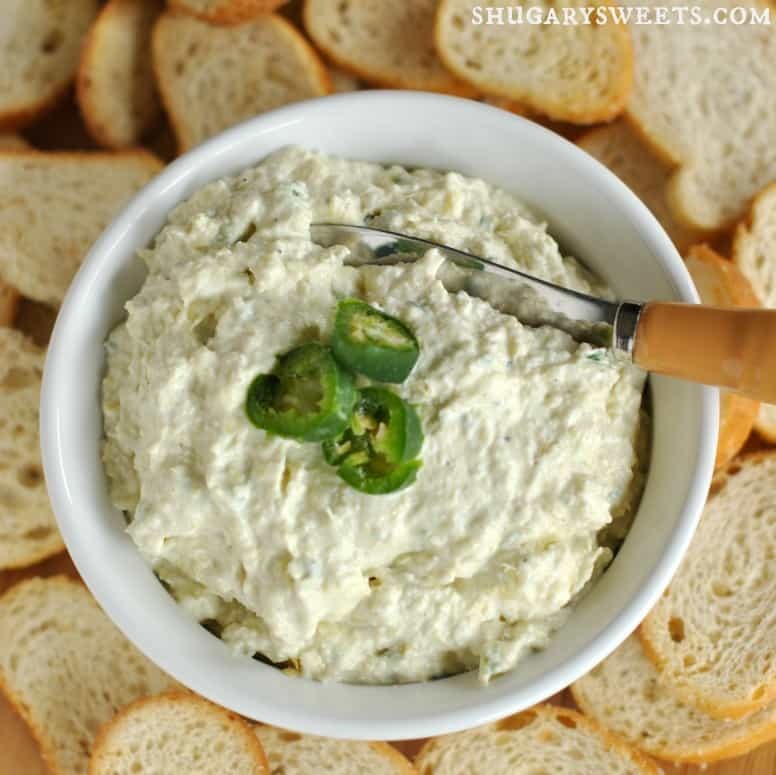 We LOVE this dip and I’ll have to try the peppers and green onions version – it sounds amazing! I didn’t know you were a nurse! That’s cool. 🙂 And this dip – OMG. I love it! Pizza dip is my FAVORITE. I would never judge. Mashed potatoes is a perfect dinner. Top it with cheese and bacon and you’ve got a full course meal. Oh. My. Gravy. Shut up right now. Pizza dip? I am salivating. Warning to myself: NEVER visit Aimee’s blog while hungry. EVER! And BTW, I am now booking a red eye to your home STAT. Ummm, good morning. Where are you? Your flight didn’t come in! I serve dip for dinner all the time. It’s pretty much always awesome! This one looks great!